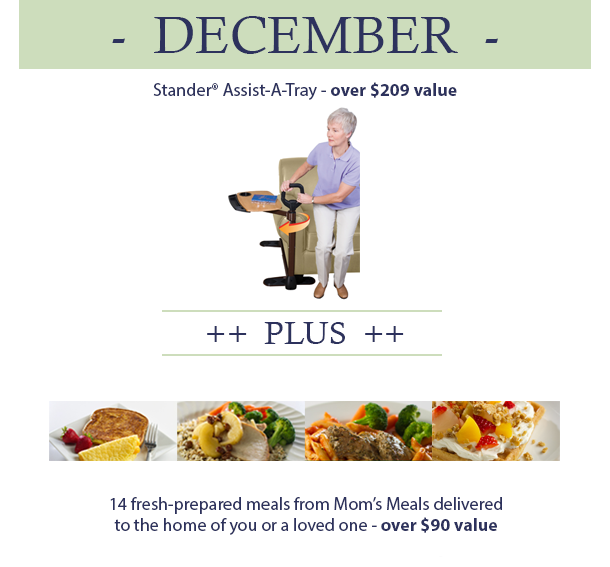 Enter this month for a chance to win a Stander Assist-a-Tray plus 14 home-delivered meals. Each month, we highlight a family caregiver solution that one lucky winner receives with no purchase necessary and no strings attached. Items given away are products and services that help seniors live more independently and gracefully in their homes. This month’s prize giveaway in our “Helping You Get On With Life” sweepstakes includes two items, valued at more than $299. Stay safe, comfortable and independent with an Assist-a-Tray. This combination rising aid and activity tray is from Stander, a leader in mobility products. The Assist-a-Tray features a 360° swiveling tray with cup holder — perfect for mealtime, games, crafts, using a laptop and more. The durable, ergonomic handle lends assistance while sitting or rising from a couch, chair or recliner. This prize is valued at more than $209. Enjoy 14 freshly prepared meals delivered right to your doorstep, courtesy of Mom’s Meals. Designed to meet the needs of our aging population, each meal contains fresh foods, is microwaveable and will keep in the refrigerator for two weeks. Mom’s Meals offers 45 unique meal choices, including specialty choices like low-sodium, low-fat, gluten-free and more. This prize is valued at more than $90. For a chance to win this month’s prize package, participants need only e-mail info@caregiverpartnership.com or mail a short statement explaining why the prize would be useful to him or her or a loved one. We will accept entries for this prize through Dec. 31, 2015, and will notify the drawing winner the first week of January.